Donald Boudreaux highlighted the factors that led to the idea of middle class stagnation. 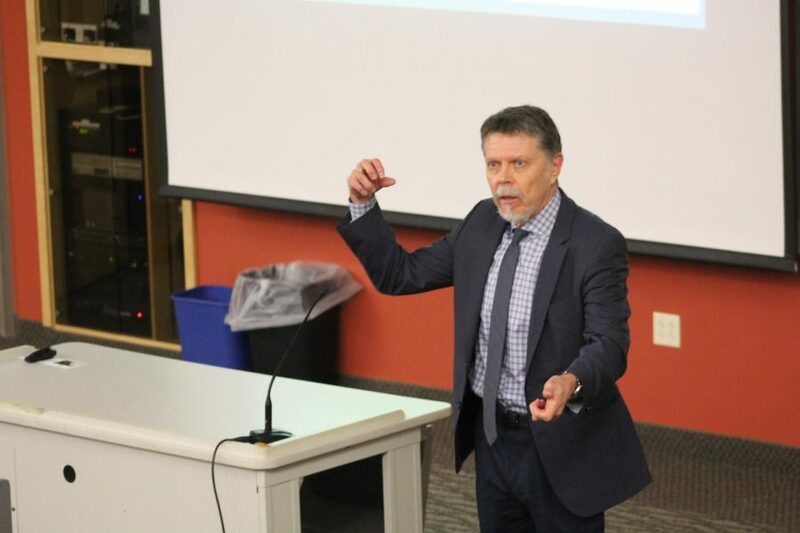 Economist and Professor at George Mason University Donald J. Boudreaux presented a lecture titled “The Myth of Middle Class Stagnation” in Valders 206 on Thursday, Nov. 2. Over 30 students and Decorah community members attended the lecture. Boudreaux then displayed a graph showing the average hourly earnings of production for nonsupervisory employees from 1964 to 2016 in the United States. He highlighted the peak as $9.39 in December 1972, the lowest as $7.69 in August 1994, and compared it to today’s wage of $8.96. His ideas were further enforced by the fact that the graph calculations were made using the value of 1982-1984 dollars and not the current dollar value. Accounting for the inflation of the dollar value over time, that would change today’s value to $22.23. After that, Boudreaux presented a second graph of the median household income growth from 1976 to 2006, which showed that in 30 years there has been an 18 percent growth in this income. Boudreaux then explained that although these graphs show stagnation, it is not the whole picture due to several factors not being taken into consideration in the calculations, including fringe benefits which are benefits that are in addition to an individual’s salary. Boudreaux proceeded to support his position on stagnation by providing a personal example and explaining how standards of living have improved in less obvious ways. In the second part of the lecture, Boudreaux compared the present purchasing power of an ordinary American worker to one in 1975. He displayed pictures of products in a 1976 Sears catalogue. He then compared the hours that an ordinary American has to work to get a similar product today, compared to the number of hours an American living in 1975 had to work. One example was a television that cost $750 in 1975 and costs $299 on the Sears website today. Boudreaux finished the lecture by answering questions from audience members. Attendee Matias Velastegui (‘18), said that as an economics student, he found the lecture interesting. However, he thought that Boudreaux did not address the question of stagnation, but focused instead on technological improvements. Associate Professor of Economics Steve Holland stated that he thought Boudreaux effectively took into consideration details that are usually overlooked by economists. While Holland found the new take interesting, he also felt that there were some pieces of the story that were left out. “I talked to a few people who attended the lecture and, like me, they felt that Boudreaux focused on our ability to buy things as a measure of well-being and failed to adequately account for the many other conditions that affect quality of life,” Holland said.